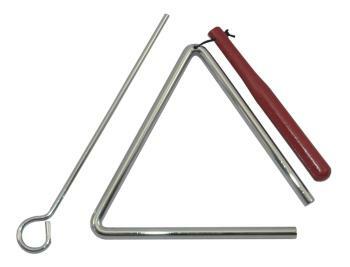 The triangle is an idiophone type of musical instrument in the percussion family. It is a bar of steel bent into a triangle shape with one of the angles left open and with the ends of the bar not quite touching. Today, the shape of this instrument is generally in the form of an equilateral triangle, usually struck with a metal beater (or sometimes with a wooden beater) and giving a high-pitched, ringing tone. The triangle was historically used for religious ceremonies. Many classical and modern composers, such as Beethoven, Mozart, Haydn, and Weber have used this instrument in their work. The famous classical work, Piano Concerto No.1 by Franz Liszt featured the triangle as a solo instrument in the third movement, giving this concerto the nickname Triangle Concerto. Today, the triangle can also be found in many types of modern music as well. IQ Plus triangles will help children develop their sense of rhythm and understanding of pitch. This instrument can also help children develop patterning skills and introduce basic mathematical concepts of sequencing. IQ Plus Triangles are excellent for a family band or group activities at school. They can be used for making classroom music while playing along with other percussive instruments.